When the price of a barrel of crude oil averaged approximately $90 between 2012 and 2014 there were something like 70 articles on Seeking Alpha covering Norwegian oil producer Statoil (NYSE: STO). On average that works out to around 23 articles in each of those years. By 2015 the price of oil had crashed to an average of $40-45 a barrel, and the number of articles covering the stock dropped to nine over the course of the year. This year we’ve seen oil sink to depths of $25 per barrel (before recovering back to the current $50 range), and just four articles written about Statoil stock. To me that looks like a classic example of peak earnings investing; the point when conventional metrics look cheap because high commodity prices lead to huge earnings. Dividends are easily covered, the P/E ratio looks low and a lot of investors get very excited about commodity stocks in dividend portfolios. Given that the oil slump has caused the exact reverse situation to occur a lot less people are inclined to cover them, even though historically they tend to represent the best long-term entry points. With that in mind maybe it’s worth taking a brief look at this oil & gas giant. As the name suggests Statoil’s roots are firmly tied to the Norwegian state. Back in the early 1970s the government decided it was high time for a domestic petroleum industry given the discoveries of vast quantities of oil offshore in the North Sea. Even today the state retain ownership of approximately two-thirds of the outstanding shares, with Statoil dividends forming a component of the mega Norwegian Pension Fund Global (currently valued somewhere in the region of $850-$900 billion). I think it holds something like 1% of the entire globe’s equity markets; pretty cool for a country with a population of around 5 million people (and kind of makes me wonder how the heck us Brits have managed the North Sea so poorly in comparison). First of all let’s take a look at Statoil returns since listing in June, 2001. As usual with oil & gas companies it’s worth mentioning returns alongside the pricing environment of the time in order to avoid falling into the peak earnings trap. Back in 2001 the price of a barrel of Brent Crude had averaged $23 in nominal terms; roughly equivalent to $30 in inflation adjusted 2016 figures. To give you an idea of what that means in practice the average post-WWII price is somewhere in the $40 per barrel region, whilst in the 1990s the average price was again around the $30 mark. All-in-all I think you could therefore describe it as a fairly unremarkable period for crude prices (which is usually an okay time to buy big oil stocks). Against that commodity price background Statoil listed in June of 2001 with an initial public offering (IPO) of 383,177,480 shares at a share price of 69 Norwegian Krone (NOK). In New York the shares listed in the ratio of one ordinary share to one American Depository Share (ADS) at a price of $7.49 per ADS. The total number of shares outstanding after the IPO was 2,164,585,600 – valuing the entire company at 149.36 billion NOK ($16.2 billion using the then exchanging rate of US $1 = 9.235 NOK). In that year Statoil generated 39 billion NOK in cash flow from operating activities and spent roughly 13 billion NOK on capital expenditures. Of the difference Statoil then paid out roughly half by way of cash dividends. In other words you were in the sweet spot where dividends were comfortably covered by free cash flow in a lowish oil price environment. An investor jumping in with a 100,000 NOK investment at IPO (roughly $10,800 at the time) would’ve bagged themselves around 1,450 shares (I’ll ignore the special 3 NOK discount that Norwegian nationals were entitled to at IPO). Over the following years they see an oil price boom driven by in large part by the rapidly developing Chinese economy – sending oil prices to almost $150 for a barrel of Brent Crude at one point in 2008, just before the worst of the financial crisis – followed more recently by a major slump. In terms of the underlying business you saw earnings-per-share hit a peak of 24.7 NOK in 2011, only to crash down to a loss of 11.8 NOK in 2015. 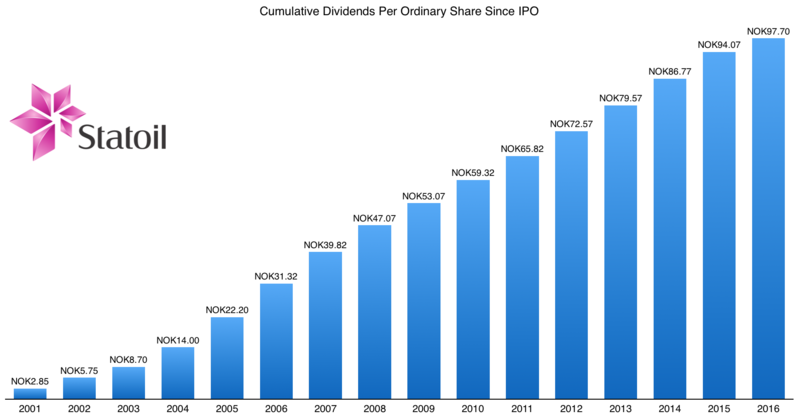 Your starting 100,000 NOK capital would today be worth 219,000 NOK, courtesy of a current share price of 151.2 NOK. In addition the company have churned out a total of approximately 98 NOK per share to date by way of cash dividends (including the Q2 2016 payment due next week). In total you’d therefore be looking at total returns of 361,100 NOK on your initial capital; or roughly 8.65% compounded annual returns. If were holding the ADSs trading in New York then the same 1,450 shares would now be worth $17.95 each, with around $13.72 paid out over the last fifteen years by way of cash dividends. Total returns have therefore been around 9.75% a year on average – with the discrepancy between the two sets of returns down to the strengthening Krone over the period. Given this doesn’t factor in the enhanced effect of reinvesting dividends I’d say those are decent enough returns all things considered. Okay so that was then, but what about Statoil stock today? Well, it won’t come as too much of surprise that fundamentally Statoil is in the same situation as all of the other oil majors at the moment. Over the first nine months of 2016 the company generated approximately $7 billion in cash from their oil & gas related operations but spent a total of $10 billion on capital expenditures and dividends. That was in a roughly $40 per barrel Brent Crude price environment. Unsurprisingly the balance is being made up with a combination of assets sales and debt. You’ll find the same situation with all of the other big names, and is part and parcel if investing in the oil majors. Given the cyclical nature of the industry you inevitably have to rely on flexible balance sheets to get through downturns with the dividends still intact. One of the big differences with this crash though was that many of the big names like Exxon Mobil and Chevron entered it with fairly leveraged balance sheets. In an ideal world you’d want them to have built up a huge war chest during the good times so that the dividend payments can continue uninterrupted during the downturns. That has the double effect of smoothing out the volatility from an investor’s point of view whilst fueling the returns accelerator. If you’re a Statoil shareholder I’d take comfort from two points though. The first is that year-to-date cash dividends have “only” represented around 20% of operating cashflow. The second is that I’d hazard a guess that Statoil is currently moving into that historical sweet spot position where dividends will be covered by free cash flow at current oil prices. Management expect cost reductions and a significant efficiency drive to add around $2.5 billion to pre-tax cashflow over the full year. The company have already driven costs for the first phase of the massive Johan Sverdrup project in the North Sea down to a total break-even point of between $25-$30 per barrel for example. That’s Norway’s largest find in two or three decades and due to come on stream in 2019. In addition Brent Crude is currently trading at approximately $55 per barrel versus $40 over the course of the first nine months of the year. Finally, projected capital expenditures over the course of 2016 is down to $11 billion versus initial guidance of $12 billion. The usual caveats obviously apply, the oil price situation being chief among them; but in return for taking on the volatility you get a starting dividend yield in the 5% region. Assuming the company become cash flow neutral within the next 18-months that should prove to be a handsome entry point given the current price environment.